Once more while crossing the street, taking a stroll, sitting by the window or in cafes and parlours, we savour the one constant summer delight- ice cream. 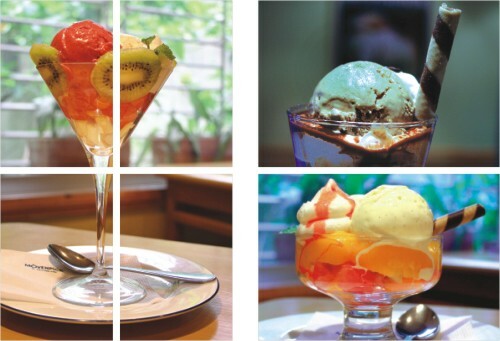 Whether it's the ten taka ice lollies or the exquisitely made gourmet sundaes, summer never tires of them and each year they appear in new flavours and colours, there to cheer us up, give us a reason to get together for some 'adda' or simply to cool us in the scorching heat. Among the other ice cream places, Club Gelato has made quite an impression. Their unique flavours, including the famed Ferrero Rocher, are made fresh every couple of hours, right here in Dhaka instead of being brought in from abroad like other well known brands and are thus always, 'fresh and juicy', as the restaurant manager Mr. Alexander Gomes kindly informed us. Unlike many other places, a scoop always costs Taka 80, whichever flavour you want and regardless of whether you want it in a cone or a cup. Double scoops cost Taka 150 and triple scoops Taka 175, so the more the scoops the less you have to pay per scoop! In addition to regular ones, the place now has chocolate cones which are well worth a try. Gelato ice cream cakes are made to order and can come in any flavour you pick out at Taka 1200 per kg. They can come in up to three flavours in one, depending on the order. The store also offers sugar free ice cream that is becoming quite popular these days. It comes in flavours like chocolate, hazelnut and fresh fruits and costs the same as regular ice cream. If you are not into lounging and contemplating on your scrumptious scoop and just want to take away, you can also buy Gelato ice cream by the litre at Taka 750 or half a litre at Taka 375. Although this write up is about ice cream something must be said about the Club Gelato pastries which cost about Taka 100 and above per slice and their chocolate crunch cake which comes at Taka 1300 per kg and makes a great combo with chocolate or vanilla ice cream. 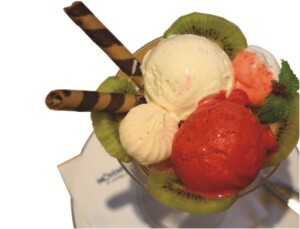 While Gelato keeps Dhakaiites dazzled with newness, Movenpick works its magic through old favourites. All their different flavours, including the popular ones like Maple Walnut, Stracciatella or Tiramisu, come in scoops of Taka 75 in cups and Taka 100 in cones. Their cones are freshly made and make quite an olfactory impression as one enters the store. One of the relatively new flavours is Crème Broule, named after the famous dessert. And off their list of mouth-watering sundaes, costing between Taka 110 and 260, the Ice Coffee is highly recommended. Reasonably priced at Taka 195, it has a scoop of coffee flavoured ice cream floating in layers of cream and chocolate sauce and makes for a great dessert, sometimes too big for just one person to savour! Besides these, Movenpick also has a variety of floats to choose from and a kid's special with toppings like Jello that will instantly catch one's eye. With any ice cream, one can get toppings like nuts, chocolate sauce, etc which cost up to an extra Taka 50 or so and are definitely worth it. Both Gelato and Movenpick also offer selections of coffee and other drinks like hot chocolate, etc for those who want something besides ice cream at these places. Relatively new in town, TC's Best also has some interesting choices to offer. Their scoops come at Taka 69 each and their most popular flavour is yoghurt, the only flavour you can take away at Taka 373 per 400gm. Other popular flavours here are fruit cocktail and butterscotch. Among their sundaes, ranging between Taka 150 to Taka 335, and with 3-scoop parfaits and many others like the chocolate 'log-cabin', the strawberry sundae is the most loved. The place also has floats costing between Taka 130 and Taka 140. They still have a long way to go as far as popularity is concerned, but they are definitely worth a try. Finally if all else fails there is always good old Igloo ice cream to fall back on with their wide selection among which lollies are a hot favourite this season costing as low as Taka 10 and available anywhere in Dhaka and Chocbars and Shell and Cores. They too have come up with more sophisticated choices like Macho and Ego, but the old favourites still rule. So if you are in Dhaka and burning for some ice cream, it should be a walk in the park now. The heat wave in Dhaka is definitely on and though you may have already pulled out your coolest summer wear, why just prepare yourself to beat the heat? Get your home ready too. Summer's a time for lighter colours so get rid of all your magenta, black and brown furnishings that tend to absorb heat, and replace them with cooler colours like whites, ivories or beiges and pastels like lime greens, light blues and pale yellows. Also use the correct fabrics. Silk and synthetics like velvets tend to gather dust in the summer and are best suited for the cooler months. Go for summery fabrics like cotton, linen or jute. Now, all this doesn't mean you should re-upholster your sofas. 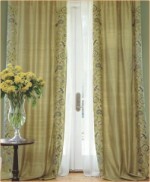 Simply change basic furnishings like cushion covers, curtains and tablecloths. A clutter-free house lets air circulate, resulting in a cooler home. So pack up all your extra hangings, curtain scallops, throws and extra cushions. Also try to do away with carpets. Besides being hot to the touch, woolen carpets tend to gather a lot of dust so it's a good idea to go with a bare floor instead. For those who just need to have that piece of colour on the floor use mats made of reeds or bamboo, or multi-coloured rugs. Their light, cooler quality makes the room seem so much lighter. Sometimes, the kind of curtains you have and their placements can determine whether you will have an oven for a home or not. Because the harshest sunlight comes in through the south, south-west and west directions, it's best to put blinds made of bamboo or heavy curtains in windows that face that direction. For those who like a bit of sunshine, put up light curtains made of sheer fabrics like voile or malmal in north-facing windows, where the not-so-harsh light comes in from. This gives the place a cheery look by letting light in but keeps the glare out too. Also try hanging blinds outside windows, not inside. Heavy curtains or blinds inside the house may keep the glare out but they don't stop the room from becoming hot because the sunrays pass through the window anyway, creating a greenhouse effect. Placing the blinds outside the window, on the other hand, prevents the sun's rays from touching the windows at all, helping the house remain cooler at least by a few degrees. Plants help create a great sense of coolness so it's a good idea to place them in corners of your house. If you don't have the space for potted plants, you can put in green bamboo in a glass vase instead to get the same effect. Place a lot of tall, leafy plants on south and southwest facing balconies or terraces to shade the house from the afternoon sun.